All the existing chapters of the previous edition have been reviewed and updated, and many new chapters have been added to reflect advancements in the field. 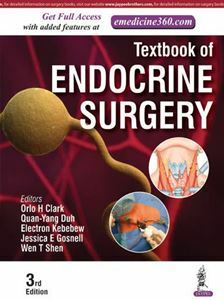 With the inclusion of color images and new tables, Textbook of Endocrine Surgery is the complete go-to guide for all questions and theories regarding endocrine surgery. Orlo H Clark MD is a Professor Emeritus of Surgery, Department of Surgery, Division of General Surgery at the University of California, San Francisco, San Francisco, California, USA. He specializes in endocrine surgery, thyroid cancer, and other endocrine malignancies, specifically the treatment of disorders of the thyroid and parathyroid, as well as the adrenal and endocrine pancreas. Quan-Yang Duh MD is a Professor, Department of Surgery at the University of California, San Francisco, San Francisco, California, USA and specializes in surgery to treat tumors of the thyroid, parathyroid and adrenal glands, as well as other endocrine and gastrointestinal malignancies. He has a special interest in laparoscopic surgery and minimally invasive endocrine surgery. Electron Kebebew MD is Chief and Tenured Senior Investigator in the Endocrine Oncology Branch at the National Cancer Institute, Bethesda, Maryland, USA. He is a surgeon and scientist. His clinical practice is dedicated to the surgical management of complex thyroid, parathyroid, adrenal and neuroendocrine tumors of the pancreas and gastrointestinal tract. His research program is focused on identifying genetic/genomic changes associated with endocrine cancer initiation and progression, with the ultimate goal of identifying therapeutic targets and novel anticancer agents for endocrine cancers, and novel diagnostic and prognostic markers for endocrine tumors. Jessica E Gosnell MD is an Assistant Professor in the Department of Surgery, Division of General Surgery at the University of California, San Francisco, San Francisco, California, USA and a surgeon who specializes in treating endocrine glands, particularly the thyroid and parathyroid. She is involved in several phase II clinical trials that evaluate novel treatments for thyroid cancer. Wen T Shen MA MD is an Associate Professor of Clinical Surgery and Surgeon, Department of Surgery, Division of General Surgery at the University of California, San Francisco Medical Center at Mount Zion, San Francisco, California, USA and the Helen Diller Family Comprehensive Cancer Center specializing in surgery of the thyroid, parathyroid, and adrenal glands.